Horses are very rare in Africa. The few to be found west of Sudan, from the lands of the Sahara and Sahel down to the fringes of the tropical forests, belong to the king, the chief warrior and to notable persons. Due to the dense humidity of the tropical rainforest and the deadly tsetse fly, only restricted numbers of horses survive. And yet rider and mount sculptures are common among the Dogon, Djenne, Bamana, Senufo and the Yoruba people. The Akan - Asante people of Ghana and the Kotoko of Chad produced a good deal of small casting brass and bronze sculptures. Some of the artists could barely even have caught a glimpse of a horse. 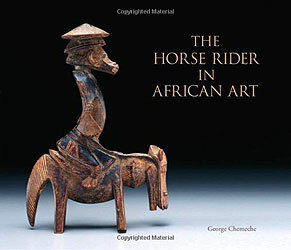 This visually stunning book presents a wealth of African art depicting the horse and its rider in a variety of guises, from Epa masks and Yoruba divination cups to Dogon sculptures and Senufo carvings. In Mali, the Bamana, Boso and Somono ethnic groups still celebrate the festivals of the puppet masquerade. The final chapter of this book is dedicated to the art and cult of these festivals, which are still alive and well. It is not the habit of the African artist to provide intellectual statements for his work, yet his unique creative dynamic and far-searching vision does not conflict with that of his Western counterpart. It is fair to state that the African, who though not educated in Western art history, contributed his fair share to the shaping of modern art. Features works from museums in both Africa and Europe, including the Musee Royal de L'Afrique Central, Tervuren in Belgium; Afrika Museum, Berg en Dal, Netherlands; Musee du quai Branly, Paris; Museum Rietberg, Zurich; The British Museum, London; Museu National de Antologia, Lisbon and National Museum, Lagos, Nigeria.